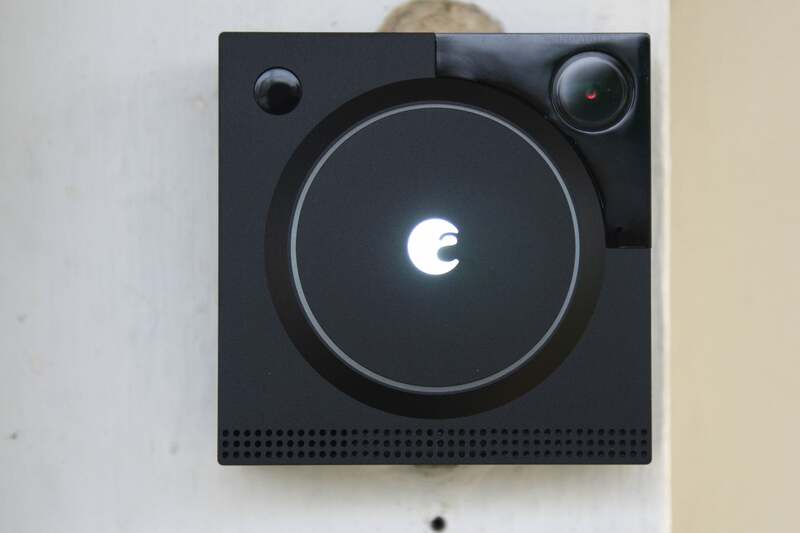 If you want to make a bit of a statement at your front door, the August Doorbell Cam Pro 2 will do the job. At just under three inches square and an inch deep (7cm square and 2.5cm deep) and with a large oversized button, it's sure to be noticed by callers. It provides a clear image and in my testing didn't get set off constantly by passing cars or leaves blowing around in the wind. There are a couple of tweaks I'd like to see and the subscription fee is on the high-end, but if you have an existing August smart lock (the August Smart Lock Pro us is our top pick in the retrofit category), the doorbell makes a good companion. One consequence of the square design is that you'll need to make sure the bell can fit where you intend. If it's going on the side of your house then you're probably fine, but if you want it on a door frame it might stick out over the edges. And if you're replacing a vertical doorbell, you might need to apply a little paint to cover up where the previous bell was installed, as was my case. 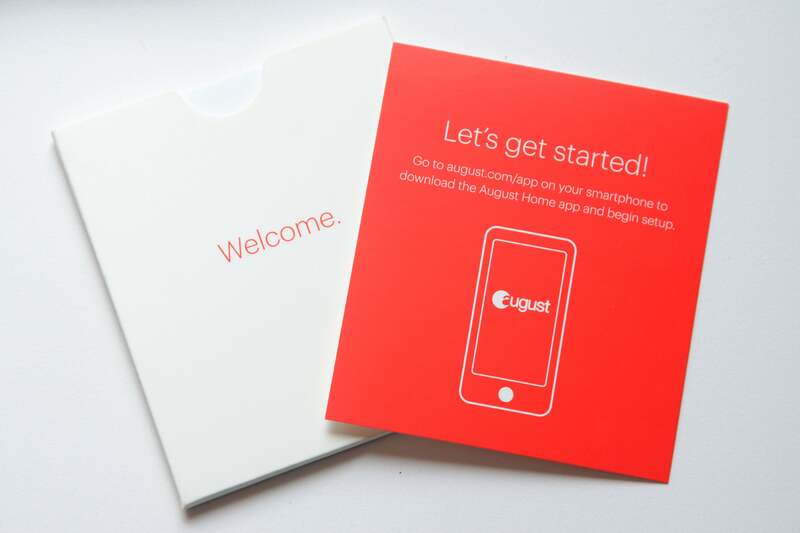 Perhaps the most disconcerting part of the whole installation experience is when you first open the box, find a little card that says "Welcome," and then realize that's it. There are no instructions in the box. A card in the box points online for installation help. There's an installation guide built into the app, and at first it threw me, but it's a pretty good idea because it offers a step-by-step guide with pictures based on whether you're installing on wood, concrete, brick, cement, stucco, drywall, or vinyl siding. Installation isn't difficult: a mounting plate screws onto your doorframe or house and connects to the existing doorbell wiring to draw power. To get a clearer view, August also supplies a plastic wedge that can angle the doorbell left, right, up or down. The doorbell clips onto the frame, and there are a couple of small catches that can be set to stop anyone grabbing the bell from your house. 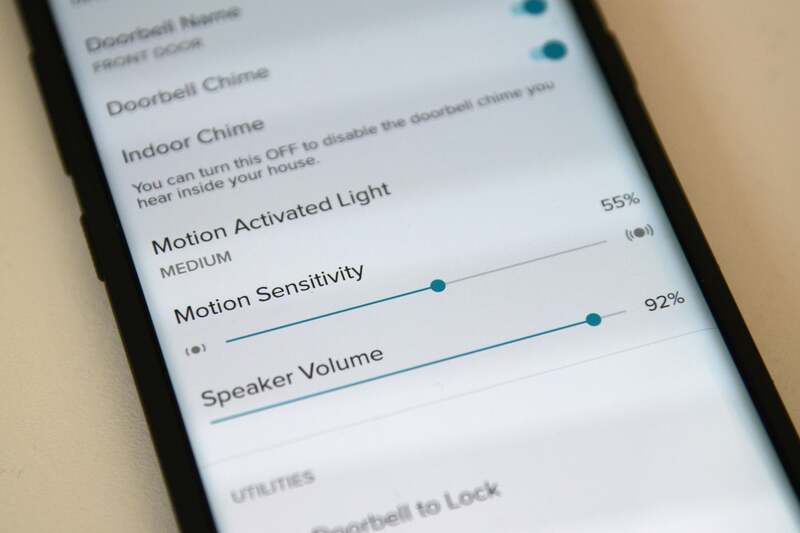 There's only one sensitivity setting for the August Doorbell Cam Pro 2. The image from the camera is nice and sharp on a smartphone screen. It displays video in portrait mode and the image doesn't rotate if you flip your phone around. This means you get a pretty good look at what's going on in front of your door but little visibility on either side. The resolution is 960 pixels by 1,280 pixels and the field of view is 120 degrees. That covers your doorstep, but not the entire front of your house. One thing I'd like to see is an adjustment for the brightness or exposure. With the bright sky behind some callers, seeing their faces can be difficult and an on-screen brightness control would help that. If you don't have a dark porch, this might be less of a problem. 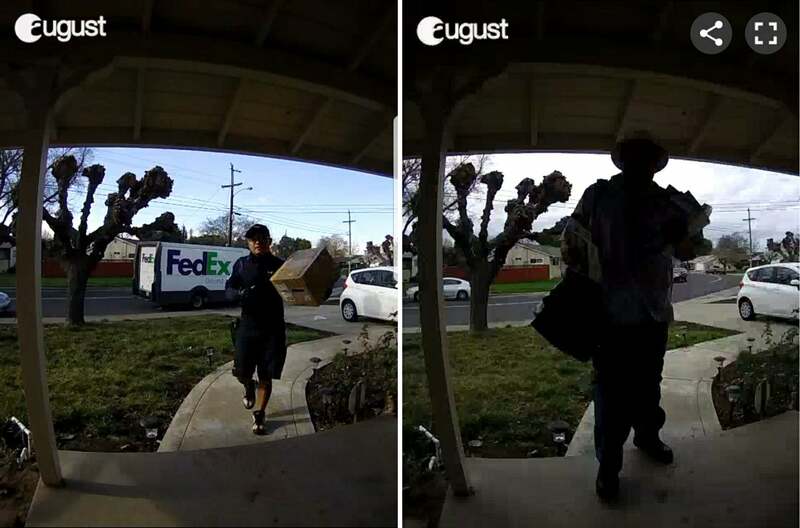 The faces of these delivery workers approaching the camera are unexposed. Detection is based on an infrared sensor and there is no video detection, but that's not necessarily a bad thing. My front door faces a street and video detection is pretty much useless because passing cars routinely trigger it, so the August began with far fewer false positives. There's a sensitivity setting for the detection but that's pretty much it. There are no detection zones. When someone rings the doorbell, you'll hear a pleasant repeating chime and your phone will come alive, mimicking it. Your old mechanical chime will ring as well. If you want to switch off any of the three, you can do so through the app. On your smartphone an alert accompanies the chime and allows a quick live view from the doorbell cam. If you miss the action, you can review recorded video. The camera features a pre-record function called "Hindsight" that continuously buffers several seconds of video so that when triggered, it can provide video of not just what happens next but what happened before. When you first install the doorbell, you get a month of free cloud storage for recorded videos, but you'll have to pay once that's done. A subscription costs $5 per month or $50 if paid annually. One of the features of August's doorbell cam is a little light in the middle of the doorbell button. August calls it a "floodlight" but it's no replacement for a real floodlight or even a porch light. The light is needed because the doorbell isn't equipped with the infrared LEDs needed for night vision. That can be good, because you get to see real colors at night, not a grayscale image. But I found the light on the doorbell just doesn't illuminate enough area. When someone is at your doorstep, it provides enough light to see their face, but it's not strong enough to illuminate them as they approach. So keep your porch light. The August icon in the middle of the doorbell hides a light. 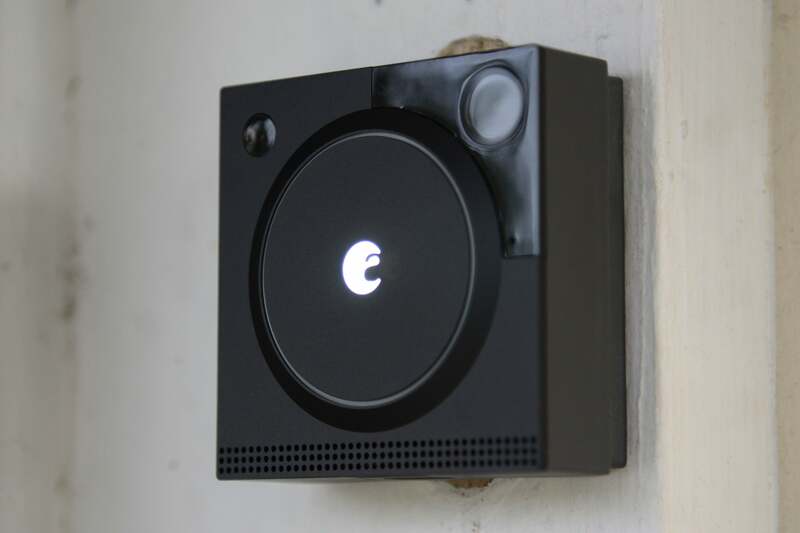 This video doorbell will work together with August's smart lock and and its Smart Keypad to provide look-out and access, if desired, to your front door. The smart lock can be opened remotely from the same app, so if a delivery person comes to the door, it's technically possible to unlock the door so they can place a package inside, and then re-lock it when they are done, all while watching and conversing with them through the doorbell. You can also connect Nest cameras and thermostats to your system, enabling you to view multiple camera feeds using August's and triggering your HVAC system to fire up when you unlock the door (although it might be better idea to rely on the thermostat's Home/Away Assist feature for that, so your home will be at a comfortable temperature before you arrive). You can also view video from the doorbell on an Amazon Echo Show. It's worth noting the Doorbell Cam doesn't have as much compatibility as August's door lock, which works with a wider range of devices. The August Doorbell Cam Pro 2 is a solid performer. During my testing it worked as advertised, and the company has put a lot of thought into the installation process. I also like the design, but that's a personal preference. I'd like to see an exposure control on the video image, and the "floodlight" really didn't do a great job of nighttime illumination. The subscription is more expensive than competitors like Ring, which charges $30 per year, and SkyBell, which has no subscription fee. 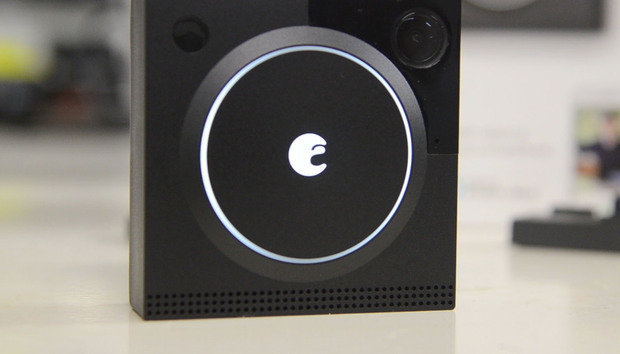 It also lacks some of the smart home compatibility of the SkyBell.